A storm hits Bear Country, and Bear Country might flood! It's up to the Bear family and the rest of the rescue team at the Chapel in the Woods to come together and save their community. 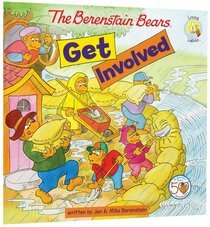 About "Get Involved (The Berenstain Bears Series)"
Stan and Jan Berenstain were already successful cartoonists for magazines and adult humor books when they began writing children's books. The first story starring the bear family, The Big Honey Hunt, appeared in 1962. Since then, more than 250 Berenstain Bears books have been published, and more than 260 million copies have been sold. What began as an idea sparked by their young sons' interest in children's books has become over the years arguably the best-selling children's book series ever. Stan passed away in 2005, and Jan in 2012, but their legacy has been continued by their son Mike. Stan and Jan Berenstain introduced the first Berenstain Bear books in 1962. Mike Berenstain grew up watching his parents work together to write about and draw these lovable bears. Eventually he started drawing and writing about them too. Though Stan died in 2005 and Jan in 2012, Mike continues to create the delightful Bear adventures from the family home in Pennsylvania ... in an area that looks much like the sunny dirt road deep in Bear Country!